Habit: Perennial herb, unarmed. Leaf: odd-1-pinnate; stipules scarious or leaflet-like, fragile or not, early-deciduous; leaflets 3--15, often +- opposite. Inflorescence: several-flowered umbel or 1--2-flowered, axillary, generally peduncled, often bracted. Flower: corolla yellow, white, or pink, fading darker; 9 filaments fused, 1 free. 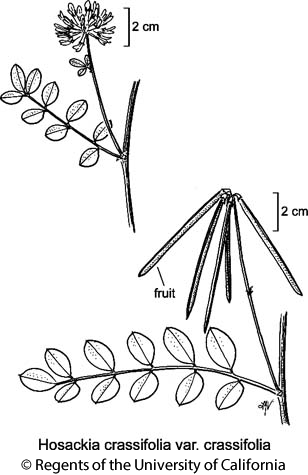 Fruit: dehiscent, exserted from calyx, linear to oblong, +- beaked. Seed: few--several. Species In Genus: +- 11 species: southwestern Canada, western United States, Mexico to Guatemala, especially California. Etymology: (D. Hosack, New York physician, botanist, mineralogist, 1769--1835) Note: Pollen apertures 3. Intermediates may be hybrids. Habit: Often robust. Stem: sprawling or erect, 7--15 dm, base hollow. Leaf: stipules scarious, inconspicuous; leaflets 9--15, 2--3 cm, elliptic or obovate, length generally 1--2.5 × width, abaxially pale. Inflorescence: generally 12--20-flowered; peduncle bract 0 or generally well below umbel, (1)3--5-parted; pedicels generally 3--6 mm, > 3 mm at least in fruit. Flower: calyx 5--8 mm, lobes < tube; corolla 12--17 mm, yellow-green, dark-blotched in age, claw exserted from calyx tube. Fruit: 3.5--7 cm, 3--5 mm wide, oblong, glabrous. Seed: several. Chromosomes: 2n=14. Habit: Glabrous or strigose. Flower: ovules +- 14--35 (> 24 in south). Ecology: Common. Chaparral, pine or mixed woodland, roadsides, disturbed places; Elevation: 300--2100 m. Bioregional Distribution: KR, NCoR, CaRH, SN, SnFrB, SCoR, SCo, TR, PR, MP; Distribution Outside California: to Washington, Nevada, Baja California. Flowering Time: May--Aug Note: Conspicuous. Citation for this treatment: Luc Brouillet 2012, Hosackia crassifolia var. crassifolia, in Jepson Flora Project (eds.) Jepson eFlora, http://ucjeps.berkeley.edu/eflora/eflora_display.php?tid=91757, accessed on April 20, 2019. KR, NCoR, CaRH, SN, SnFrB, SCoR, SCo, TR, PR, MP; Markers link to CCH specimen records. Yellow markers indicate records that may provide evidence for eFlora range revision or may have georeferencing or identification issues. Purple markers indicate specimens collected from a garden, greenhouse, or other non-wild location.